Four students from Plattsburgh State's Reserve Officer Training Corps took part in a staff ride and battlefield tour of Saratoga in one of the largest military helicopters as part of their training Wednesday morning. Anthony Migliore, Jeremy Boissy, Wade Collins and Dave Franza were joined by their some of their affiliates from the Green Mountain Cadet Battalion from the University of Vermont on the trip. 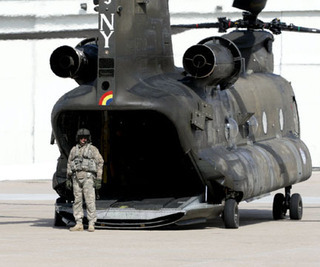 Two bus-sized CH-47 helicopters would be providing transportation for the day. "We've been planning this since last semester," Migliore said. "It took a lot of coordination with different National Guard units." The staff ride, the first of its kind since the program's inception in 2007, is the culmination of a series of presentations the corps has been working on all semester. Each group is assigned a different portion of the battle, and they present it during class. "We hope they learn about the battle from a historical aspect," said Maj. Chris Dobozy, an ROTC instructor. "We also hope they learn the moving parts of an operation that has a lot of parts to it." By taking the hour and a half long trip down to Saratoga, the students got to study and analyze military operations while gaining insight into what it's like to be commanding troops in combat, Dobozy said. Franza, a senior in his second year of the program, said he thinks the interactive element of the staff ride is helpful. "You're actually going through the process and analyzing it," Franza said. "I think it's better that way." Migliore and Boissy are a part of the first four-year graduating ROTC class at PSUC. The seniors agreed the program has come a long way since they first started in 2007. "We never did this when we started," Boissy said. "As the program has grown and progressed, we've been able to do more of this. It gives you an opportunity to see more of what the Army has to offer." The cadets all agreed that the staff ride was a nice change of pace. "It gets you out of the daily grind," Boissy said. "Army training gets a little monotonous at times." The cadets started out their day in the ROTC office in Sibley Hall then made their way to the hangar at the U.S. Department of Homeland Security at Plattsburgh International Airport, where they waited for about an hour for the helicopters to arrive. The helicopters, deafening propellers cutting the air, arrived carrying the cadets from Vermont. The Chinook is the second loudest helicopter after the UH-60S Black Hawk and is the fastest in the inventory, Dobozy said. And that pace is matched by the development of the ROTC program at PSUC. Joe Notch, an air interdiction agent for Homeland Security, said he is impressed by PSUC's program and the students in it. "The program is developing very rapidly," Notch said. "Normally a program starts slow and takes several years to get to where Plattsburgh has grown in a short amount of time." While the program is developing well, there are obstacles — the most glaring of which is geographical. PSUC is the satellite program to UVM, the host school, in Burlington, Vt.
"For having a geographic boundary, they do outstanding," Notch said. "The cadets are very motivated. They're in constant competition in this program, so their development speaks highly of how they perform and approach the training themselves." Dobozy said that as the summer approaches, the older students are getting more serious. "My guys right now are at the point where it's make it or break it," Dobozy said. "This summer is going to determine whether they get into the Army or not. The jovial attitude is gone." But the cadets were able to show some of their lightheartedness as they walked onto the Chinook to meet their partners, all the while maintaining their posture as they advanced through the gusts of wind and heat emitting from the helicopter. Dobozy and Notch maintained communication with the choppers via walkie-talkies until they flew out of sight south of Plattsburgh over Valcour Island. "The main point of this is to make the program better and to get the word out that ROTC is in Plattsburgh," Dobozy said. "It's a great program. I was in the ROTC when I went to school. You have to give a little bit, but you get a lot back."